Greetings all! 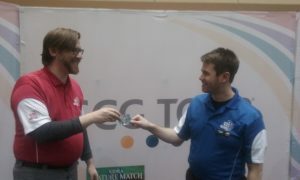 I am Rob McKenzie, Level 3 judge and Regional Coordinator of the USA-North region. I’m here today to talk about a nifty item I’ve used at a couple events, Flash Feedback Cards. If you have been at a recent show with me, you have probably run across these – I’ve given them out to judges to distribute at GP Indy, GP Milwaukee, the most recent Minnesota RPTQ, and the SCG Open in Indy. 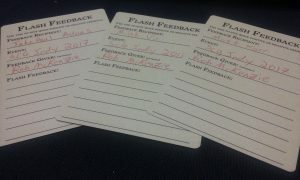 I’ve also used them to provide feedback at several different shows where I did not give them to everyone. This article will delve into I came up with the idea, how I’ve envisioned them being used, and the cool uses I’ve seen people put them to. One of the things I do when I am bored is search for ways to directly produce things. I worked for Steve Port of Legion Supplies for a while, and he tries to go down to bedrock and produce items – you can see this in play with Legion Supplies, where he started making sleeves and deckboxes for GPs, and then just kept doing so to make money. I kind of picked up the “make stuff” bug from Steve and never lost it. So I have a folder of random things like 4imprint for producing regional judge swag, and I had been kicking around some personal project ideas using a site called SuperiorPod.com to produce cheap board game cards that look nice. 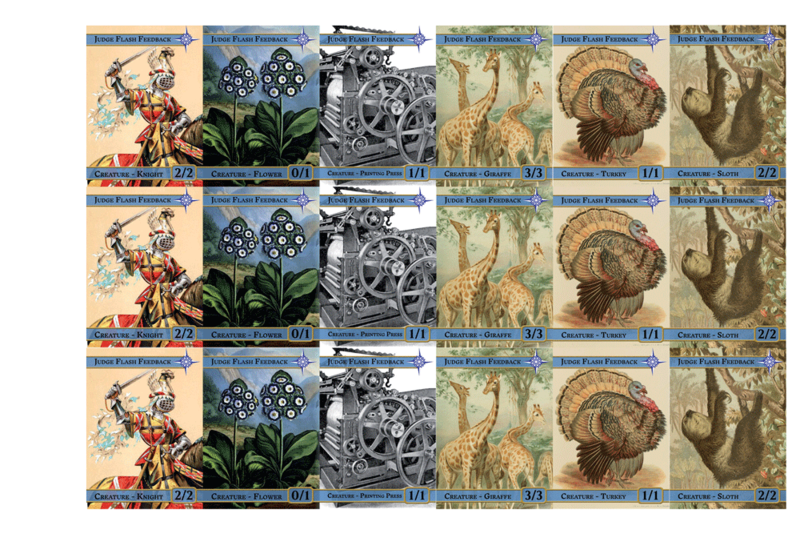 I was doing some math for this and, using their standard/poker size card printing options, the numbers were super cheap to do reasonably sized runs of cards, with 18 to a print sheet. I just needed something I wanted to make. I sat on that idea for a while, and then I saw Riki’s post about flash feedback – giving super short feedback that is just meant to hit one specific thing for feedback. It all kind of clicked – why not make a feedback form that could only be used for a short piece of feedback? Cool idea, but notecards are cheap. How are these going to be better than just giving out notecards with instructions to write notes on them? Well, tokens are sweet! Everybody uses them. I even use token-sized cards for personal business cards and people love those. So I decided to use my business card template I had made for the fronts, and throw some tokens on the side not used for feedback. I just needed art. I went spelunking through art from over a century ago, and stumbled on color lithographs. They are over a century old, in the public domain, and super amusing in some cases. I spent a few hours pouring through a handful of sites and ended up with a couple dozen images I wanted to look at. The sloth was obvious. The giraffe was too amusing not to use. It was close to Thanksgiving, so I grabbed a turkey. I wanted a faux-servo, so I grabbed a printing press. I thought one of the flowers was pretty and made it a faux-plant. I should have held off on the knight, but he was amazing and had an unbelievable hat, so I included him (I made Exemplar tokens this last wave, and would have loved to use the knight for them). I put together an order of 40 “sheets”, so 120 of each image, a total of 720 cards. This cost $86.59 after shipping. Pretty cheap, all told. I gave packets to all the judges at GP Milwaukee, along with North Region Judge notebooks and pens, without much explanation as to how to use them, just a “use these to give feedback!” I was leery of giving super tight instructions that would lock people into making only specific use of them. I wanted people to use them as they wanted to use them. The lack of instructions was confusing. Should I use these for positive feedback? Negative feedback? Or what? “Subject” was a bad word to use, it could mean either “person” or “topic”. There are potential negative connotations to the Sloth card. People could feel like they are being called sloths if they get the card. The sloth card is awesome, and I want fifty. Why were the other card jokes not as clever as the sloth? I did rework the backs a little bit, to put a note about how to use the cards, and swap out “subject” for “recipient”. These then went out at GP Pittsburgh and SCG Indy, and people made some great use of them. I used a full packet at SCG Indy to give feedback to all my Saturday team leads on their performance, plus a few other judges I had specific interactions with. 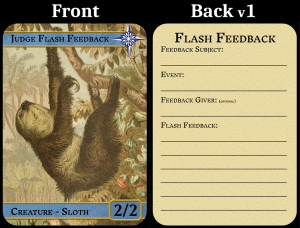 One of the things I’ve found is that having a physical token of feedback feels great – good or bad, you have a sweet Sloth or Giraffe to use, and you can put them in your keepsake binder or EDH deckbox, which encourages people to use them. One team lead I worked with set his team members a goal of using all 6 of their cards during their day. They all did from what I know, and they got to really interact with people about the feedback. One thing I’ve run into is giving out the card, and then the little snippet I wrote leading to further discussion and more in-depth information being exchanged. It opened up a full conversation that would not have happened otherwise. I’ve seen people use these to give “attaboys” more than “I think you could do this betters”, but I have seen the latter on a couple occasions. The length maps out to a tweet, or something close, which is pretty interesting. Can you use just 6 short lines to say something meaningful that someone can look at in a year and say “huh, yeah, I remember that” about it? What do you need to do this yourself? First, you will need to figure out templates and construct a front of card and back of card. If you want to use my slightly sloppy behind-the-scenes ones, drop me a line at robbit@gmail.com and I’ll ship them over to you. They are reasonably large Photoshop PSD files, so I don’t really want to try to distribute them to the world at large. Second, grab some images. There are a ton of public domain sources. I used Old Book Illustrations for my initial images. Probably the deepest source you could go through is the New York Public Library Digital Collections. There are a ton of them. Just make sure to find some place reputable, and either get permission from the copyright holder or use things that are in the public domain. If you are in the US, SuperiorPod is super cheap, pretty fast, and responds quickly to contacts. I strongly recommend them. There are a number of other print on demand places to use – I suggest looking for “custom poker decks,” because that’s essentially what you are doing. ArtsCow sometimes runs sales that will beat SuperiorPod in price. Third, have a plan to distribute things. Get your prints done well before you need them (I failed at this; I could have saved $20 on my first run between rush printing and shipping). You will probably have to repack things into sets.Get some penny sleeves for this. Fourth, communicate clearly. Most of the feedback I got was about communication, on some level. Let people know what you want/expect from the cards. I’d love comments, questions, and feedback. Just drop me a line either in the comments here, on reddit, or email me at robbit@gmail.com if you want to chat about these more or get more info about making your own.